Es un destino ideal para los amantes de la cultura china, de naturaleza y de playa. Puedes comenzar tu periplo visitando Taipei y sus alrededores, durante dos o tres días. Emprende a continuación el camino hacia los templos budistas. En la carretera, el paisaje cambia, en cuestión de kilómetros, de las llanuras costeras agrícolas a las altísimas cumbres nevadas del centro. Puedes finalizar tu estancia descansando en las playas del sur del país. Los paisajes: El lago de Corail, El lago de Shih-men, El lago del Sol y de la Luna, Las Gargantas de Taroko, Las fuentes termales de Beitou y Wulai. Las costas: La costa meridional, La costa norte, El archipiélago de Pescadores. Las ciudades: Taipei, Alishan, Pei-kang, Tainana, Jioufen, Wulai, Yeliu. 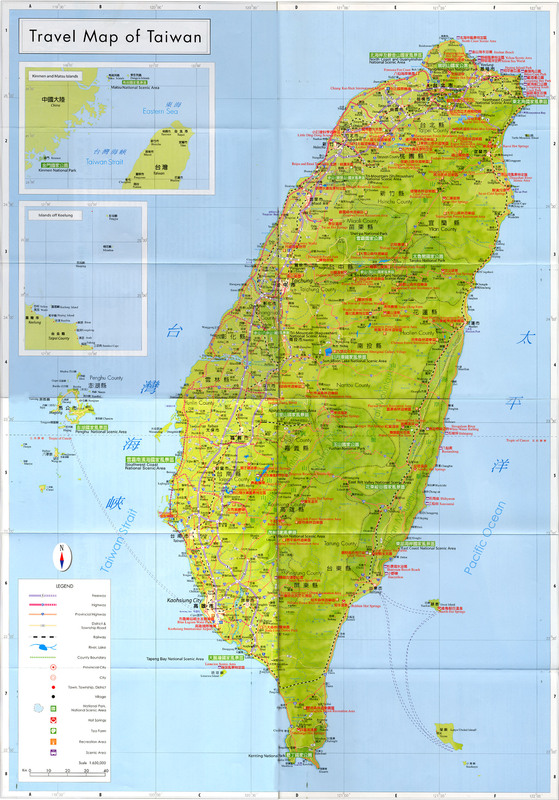 […] Taiwan is known for its towering mountains, and is reputable as a “Mountainous Island”. The island is spotted with numerous mountains over 3,000 meters. It is also home to Northeast Asia’s highest mountain, Jade Mountain, which is nearly 4,000 meter in height. Besides mountains, beautiful coastal scenes are also part of Taiwan’s great natural asset. Starting from the northern tip of the island is the North Coast & Guanyinshan National Sccenic Area and Northeast National Scenic Area that features various sorts of coastal geography… Traveling all the way down from here, one will first arrive at the scenic Eastern Coast National Scenic Area and East Rift Valley National Scenic Area, and then the Tapeng Bay National Scenic Area blessed with sunshine and tropical touch. Alongside the mountainous areas is the Maoling National Scenic Area , where a lot of aborigines live and place one can check out the world of butterfly, Lukai stone-made houses and Natural scenes in Taiwan. Legendary tales depict subtle beauty of Alishan National Scenic Area , where you can enjoy the relaxing scene of sunrise & cloud sea. Natural setting of Sun Moon Lake National Scenic Area , eagle-spotting at Bagua Mountain, home of fruit-Lishan can sacred Buddhist sanctuary- Lion Mountain, can bring to you the many faces of the island’s beauty. Penghu National Scenic Area , comprising of sixty-four islets, scattering around the Taiwan Strait.